i heart peonies: mmm... mustard! Once upon a time, I dreamed about a chair. I drooled, I lusted, but my budget could just not make it work. Then I walked into Anthropologie and found it as a sample at 50% off. And it was mine. I use it to pose my baby. That chair actually lives in my living room, with some lovely drapes. The fabric from these drapes was also out of my price range, but then I found a 20% off coupon AND my mother-in-law offered to make them for me as a house warming gift. Isn't she awesome? They mirror the chair perfectly. I use them to pose my baby, too. Now I find this wallpaper. It is called paeonia... PEONIES! A perfect wallpaper to tie my living and dining rooms together, to match the chocolate drapes that I already have hanging, with a nice bold pattern to flatter all my white trim and cherry stain. I have been wanting to wallpaper my dining room since we bought the place, but I keep falling in love with these pricey rolls. This is no exception at $148 a roll. With the repeat and everything, I would need about 20 rolls to cover my tiny dining room. Now I wait, impatiently, for it to go on rock bottom sale. Tick, tock. she's so beautiful nat. oh and the wallpaper is nice too... :) love that chair! How sweet! Cute baby and love that mustard color! Absolutely lovely -- all forms of that fantastic color and print. On the wallpaper front, another option is to hang just one panel, or a few, as large-scale wall art (in a strip the width of the panel and a length of several feet). It's most attractive when highlighted with a frame, which isn't necessarily cheap. But still cheaper than 20 rolls! Are you crafty at all? 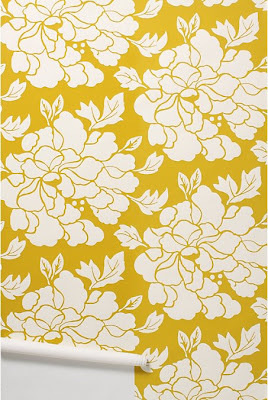 I'm wondering if somewhere exists a wall stencil of peonies that you could use for the look of wallpaper. Maybe have a Google one day when you're bored. p.s. found your blog by researching that peony wallpaper. i want it too--badly!! !